Picked up another interesting environmental story today. Possibly one of the silliest things Australia has done was to introduce poisonous cane toads into the environment during the 1930s. People probably thought it was a good idea at the time – the toads were imported from South America to devour beetles feasting on sugar cane crops. But cane toads soon become a scourge on the Australian landscape and caused the death of native animals that ate the toads and they edged out native insect- eaters. As officials rush around trying to capture the toads and freeze them to use as fertilizer, the clever cane toads have leapt one step ahead on the evolutionary scale by producing 10% longer legs. New generations of cane toads boasting longer legs are able to spread faster and more widely. Currently, the feisty cane toad occupies 1 million square kilometres of the Australian continent and can advance more than 51 kilometres annually, compared to 10 kilometres when first introduced. 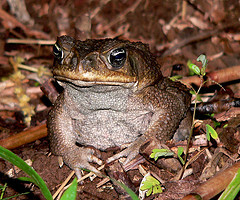 No documented extinctions are attributed to the cane toads. But the toads dramatically modify the abundance and diversity of plants and animals in the ecosystems they invade. A monster toad was found in Darwin the other day. 38 centimeters long and apparently the size of a football. Check out the toad here. The evolution of CSR	Can you learn to be happy?